Low-Carb Cauliflower and Mushroom Pressure Cooker Soup with Parmesan can be made in the Instant Pot, electric pressure cooker, or stovetop pressure cooker! My sister Pam’s family loved this low-carb, Keto, low-glycemic, gluten-free, South Beach Diet friendly, and vegetarian soup. Use the Diet-Type Index to find more recipes like this one. Click to pin Low-Carb Cauliflower and Mushroom Pressure Cooker Soup with Parmesan! A few years ago I bought a Kuhn Rikon Pressure Cooker, and shared a few Pressure Cooker Recipes on the blog. So when my sister Pam got a new Cuisinart Electric Pressure Cooker, and my friend Barbara started a blog about using the electric pressure cooker, I really didn’t think I needed another pressure cooker. Then I got a couple of Amazon gift cards, and the next thing you know, a new electric pressure cooker arrived at my house! So far I’ve only used it to make chicken stock, and then this amazing soup, but I’m already pretty infatuated with the new electric pressure cooker. If I had to pick one feature, it would be the way you can set the time and walk away, knowing the pressure cooker will stop cooking and release the pressure, even if you forget about it. Since there’s no flour, butter, milk, or cream, this delicious low-carb Cauliflower and Mushroom Pressure Cooker Soup with Parmesan is perfect for January when everyone is focused on lighter meals. Cut up about 4 cups of small cauliflower pieces, and if you look closely you can tell that mine had a few brown edges cut off! Put the onions, cauliflower, mushrooms, and stock into the pressure cooker. Set the pressure cooker for 5 minutes at high pressure (or bring stove-top pressure cooker to high pressure and cook 5 minutes.) I wasn’t in a hurry, so I let the pressure release naturally, but you could also use the quick-release. Here’s how the soup looked after it had cooked.Then use an Immersion Blender to puree the soup, leaving it a little chunky if you prefer. Barbara says be careful, because some immersion blenders can scratch the pressure cooker, but mine was okay. (You can also puree in a food processor or blender, but the immersion blender is much easier.) Add the 3/4 cup of Parmesan cheese and simmer 5-10 minutes, or until all the cheese has melted into the soup. Serve hot, with freshly-grated Parmesan cheese or sour cream to add at the table. Check out my growing collection of Pressure Cooker or Instant Pot Recipes! Low-Carb Cauliflower and Mushroom Pressure Cooker Soup with Parmesan can be made in the Instant Pot, electric pressure cooker, or stovetop pressure cooker! Heat 1 teaspoon of olive oil in the bottom of the pressure cooker (or in a non-stick frying pan). Add the onions and saute until they’re starting to brown, about 5-7 minutes. (Use the saute setting on the electric pressure cooker or medium-high heat on the stove.) Add the minced garlic and thyme and cook 1-2 minutes more. Put onions in a bowl (or add them to the pressure cooker if you used a pan to saute the onions.) Heat the other teaspoon of olive oil and saute the mushrooms until they’re lightly browned and all the liquid is evaporated, about 5 minutes. Put the onion mixture, mushrooms, cauliflower, and stock into the pressure cooker and set to cook for 5 minutes time at high pressure. (For stovetop pressure cooker, bring to high pressure and cook 5 minutes.) I let the pressure release naturally because I wasn’t in a hurry, but you can also use the quick release method. Add the 3/4 cup Parmesan and simmer 5-10 minutes, or until all the cheese has melted into the soup. I made this in the Cuisinart Electric Pressure Cooker but you can definitely use the Instant Pot or a stovetop pressure cooker if that’s what you have. 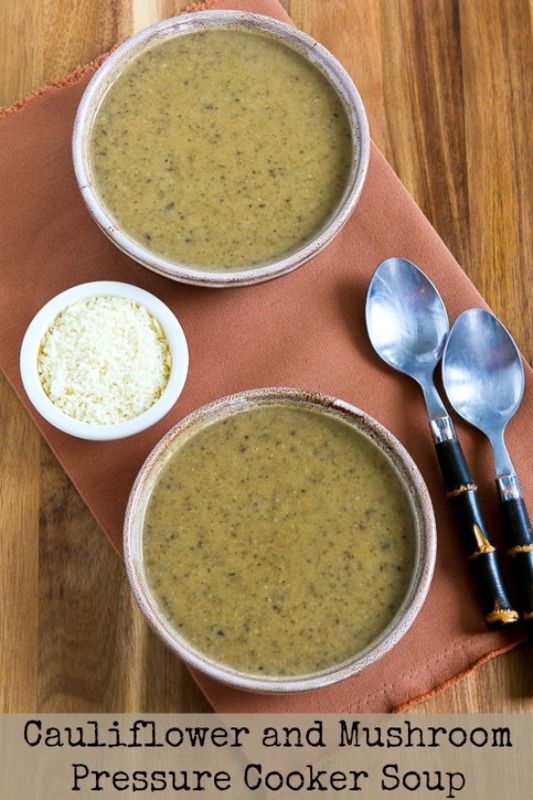 This delicious Low-Carb Cauliflower and Mushroom Pressure Cooker Soup with Parmesan would be approved for all phases of the South Beach Diet, as well as most other low-carb and low-glycemic diet plans. Im making it right now, as I work from home. I roasted the cauliflower in the oven before I put it in the Instant Pot, used less liquid (only because I didn’t read the recipe correctly) and added leeks. Smells divine. Hope you enjoy! I think roasting the cauliflower is a great idea. Going to make tomorrow. Is there a reason you don’t sauté the mushrooms with the onions/garlic/thyme? You could add them in after the onions and garlic have cooked a bit, but mushrooms release a lot of liquid when they cook so I wanted to get some color on the onions. Made this tonight- it was so good! First time I’ve used my IP. Very easy, very fast and very tasty! This recipe rocks. Thank you always get compliments! So glad you have enjoyed it! I love soups all year long. This looks so filling. A nice touch to add cheese and sour cream at the end. Thanks Ruth, hope you enjoy! This was a-m-a-z-i-n-g!!! I did add a splash of balsamic vinegar. I have been searching for a mushroom soup recipe without the heavy cream and this was perfect! Left out the sour cream. Doesn't need it. Thank you! So glad you liked it. I like your idea of adding balsamic vinegar! So glad you liked it, and thanks for sharing how it worked to cook this on the stove. And I love that the mushroom haters liked it! I made this tonight on the stove top with just the 6 cups of liquid called for in the pressure cooker recipe. After sauteing the onions and mushrooms, I added the cauliflower and broth and boiled it only about 20 minutes because I was in a hurry to get dinner on the table. The cauliflower was still a little firm, which probably gave the soup some additional texture after I used my immersion blender on it. I like a little texture in my pureed soups, so that worked for me. I also added about 2 teaspoons of salt and rather than serving it with sour cream, mixed about a cup of light sour cream into the pot just before serving. It was delicious and got rave reviews even from the mushroom haters in my family! Jeanette, isn't the pressure cooker great; I am loving this one! I just got a pressure cooker a few months ago and I can't believe I waited to long – it has made my life so much easier! Love using cauliflower in creamless creamy soups – this sounds perfect for today's wintery day. I'm posting part of this comment from Ed McGee, but I can't post the original comment which links to a site to buy pressure cookers, even if the commenter isn't affiliated with the site. Sorry Ed. "I have a stove-top pressure cooker that I love and use all the time. As far as I'm concerned it's the ONLY way to make corned beef!" GiGi and Godzilaw, I said in the post that you can cook it on top of the stove, using a little more liquid and simmering until the vegetables are done. I haven't ever made it that way, so I can't give specific information about adapting the recipe, but I'd guess about 1 cup more stock and simmer about 45 minutes. But that is only a guess; if either of you try it I would love to hear what worked. This looks great, but I don't have a pressure cooker – how long would you recommend I cook this on the stove? Thanks in advance – I love your recipes! For those of us that do not have a pressure cooker, is there an alternate way to cook this? Barbara, I can tell I will be using my new pressure cooker often! Thanks for the warning about the immersion blender. Mine seemed to be okay, but I will edit and mention it in the post. Joanne, I am loving it! Thanks Hari, it was so delicious. A pressure cooker is one kitchen appliance I still don't have! This soup looks like a great reason for me to get one! Also – be careful when using an immersion blender in the non-stick pressure cooking pot. I scratch mine up badly when I got a new immersion blender that had ridges on the bottom. That's exactly why I love the electric pressure cooker too. So glad you're having fun with it. Thanks for the link love.